For several centuries the Habsburg dynasty was one of the dominating forces on the European music scene. Its power was reflected by the splendour of the court in Vienna, and music was an important part of that. The emperors appointed some of the best performing musicians and composers from Italy and Austria. Famous musicians and the music they composed and performed were an important instrument of representation and reputation. This aspect of Habsburg power is well documented on disc. 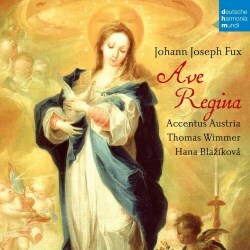 This recording by Hana Blaziková and Accentus Austria, directed by Thomas Wimmer, sheds light on one of the lesser-known aspects of musical life in Vienna and - even more importantly - the religious convictions of the emperors. Marian devotion was an important part of the Catholic faith. It had its roots in the early Middle Ages, but became increasingly important as part of the Counter Reformation, with which the Church tried to regain the ground they had lost to the Protestant Reformation. The veneration of Mary was especially important to the Habsburg emperors, in particular Charles VI who ruled from 1711 until his death in 1740. This is pointed out by Thomas Wimmer in his liner-notes. “In the course of the 17th century the adoration of Mary became increasingly important to the Habsburgs. It reached its apogee in Charles VI, who placed not only himself but his entire realm under the protection of Virgin Mary the Victorious. To symbolise this he laid his diamond-encrusted dagger on the church altar in Montserrat, thereby submitting to the command of the Virgin. On several occasions he sought permission from the Pope to allow all priests in his hereditary lands to hold a Mass for the Immaculate Conception every Saturday. Like his grandfather Ferdinand III, he too sought to have the Immaculate Conception elevated to church dogma and even proscribed any debate on the subject, whether in public or in private! Every victory of his armies was attributed to the intervention or assistance of the Virgin Mary; important decisions were often made only on her feast days”. He also writes that in some years Charles took part in more than 100 public church services, in addition to his daily private worship. One of the composers who played a central role at the court in Vienna was Johann Joseph Fux. In 1698 he was appointed court composer by Charles's father Joseph I. This is all the more remarkable, as since the early 17th century musical life at the court was dominated by musicians from Italy. In 1711, after the death of Joseph, Fux was appointed vice-Hofkapellmeister, and in 1715 Charles VI appointed him Hofkapellmeister, a position he held until his death. The programme gives some idea of the music performed in services at the court. We get different settings of two Marian antiphons, Ave Regina caelorum and Alma Redemptoris mater. The latter is sung at the end of Vespers in the period from the beginning of Advent to Candlemas (2 February). The former was sung from Candlemas until Maundy Thursday. The two settings of Alma Redemptoris mater are conceived as a unity; only in the second (K 187) the last three lines constitute a different section. In all the settings of Ave Regina caelorum the eight lines are divided into three sections, either 4/2/2 or 2/2/4. Whereas most of these pieces are written in a lively rhythm and fast tempo (“Hail, O queen of heaven - Hail, thou root - Rejoice, O glorious virgin”), the closing lines have the character of a prayer and are much more restrained: “Farewell, most beautiful maiden, and pray for us to Christ”. Pia Mater fons amoris is a non-liturgical text and here Fux takes more freedom in regard to structure. Two dacapo arias embrace a short recitative, and the piece closes with a fourth section on the word ‘Amen’. This is the form of the Italian motet we know from, for instance, Vivaldi. However, whereas the latter’s motets and comparable pieces by other composers were often virtuosic and vehicles for singers to show their skills, this motet by Fux is clearly intended for ecclesiastical use and is therefore much more moderate in its technical requirements. The fact that the vocal items on this disc were written for the church comes also to the fore in the rather moderate written-out ornamentation. Notable is the fourth setting of Ave Regina caelorum performed here (K 205). The melodic material is given to the violins whereas the soprano only sings the plainchant melody. In most of the vocal items the instrumental parts are for two violins and bc. Sometimes Fux adds a viola (K 208) and in K 185 two recorders play colla parte with the violins. In K 206 the soprano is supported by the basso continuo alone. Wimmer notes that the instrumental parts were usually performed by four instruments to a part. “However, we know from copied sets of parts in nonViennese archives that smaller forces were also permissible”. That is the way they are performed here. The instrumental music in the programme was also written for liturgical use, although some pieces may have been originally intended for secular use or have been part of larger-scale vocal works, such as oratorios. They often comprise three sections of a different character, mostly in the order slow - fast - slow. In the Sonata pastorale the two upper parts are played by recorders. Hana Blažíková is one of the brightest stars on the early music scene. Her performances here are a perfect demonstration of her qualities. She is blessed with an extraordinarily beautiful voice, her diction and articulation are perfect and as a result the text is always clearly understandable. Her voice is also very flexible, which results in immaculate performances of the small ornaments in the pieces performed here. The plainchant in K 205 comes off just as well. Accentus Austria deserves much praise for the lively and engaging performances of the instrumental parts and the sonatas. For a long time Fux has suffered from being best known as a theorist. His treatise Gradus ad Parnassum found wide dissemination in his own time; Johann Sebastian Bach was one of many colleagues who owned a copy. Fux’s own compositions have not received that much attention. It has been mainly his Kaiserrequiem and some instrumental works which have made their way onto disc. That makes this recording all the more important, as we get here a number of pieces which are little known - if at all - but deserve to be. This disc is the best possible argument for Fux’s qualities as a composer in his own right.